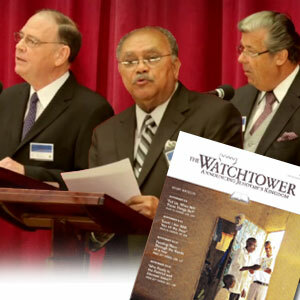 Question If the Watchtower Bible and Tract Society are God’s Organization? We need to ask if this is true. Rutherford confirmed that Jesus would return invisibly: See Rev 1 Behold he is coming in the clouds and every eye will see him. Rutherford predicted that in 1925 the physical return of Abraham, Isaac & Jacob would return. Rutherford confirmed that he was disappointed that none of the predicted dates come to pass and that there would be no more dates put forward. Watchtower August 15, 1968 “ Why are we looking forward to 1975, 6000 years from Adam” was confirmed but then adjusted based on not knowing exactly when Eve was created, never the less this has since proven to be a false prediction due to the number of years past. Christ A created Being or God? In Genesis 41:51,22 It talks about Manasseh being the 1st born, and Ephraim being the 2nd.Then in Jeremiah 31:9, Ephraim is now called “1st Born”. So how can we have two 1st Born? When we look more closely at his Greek word for 1st Born as is the case in Colossians, it is far more widely used to mean “pre-imminent, and therefore this must be what the word meant, as the only logical option. So when you use this word in Colossians, taking into account its context, it reads far more accurately when we say “pre-imminent over all creation, especially when we have to reconcile other scriptures about Christ. Going back to Colossians 1:15, which we can see based on the original Greek, clearly shows Jesus must of created all things (the word “other” in the NWT simply does not exist in the original Greek see KIT above) and as later on in the verses 16-18, “existed before all things”, he could not of been created, because if he was, he would have been a “thing” and therefore it is impossible to exist before “all things”. As also concluded by millions of Christians and Bible scholars that Jesus must therefore be God, and of course these are a number of scriptures to support this, especially when you look at the “correct translation” from the original Greek. This method of understanding the true meaning of scriptures also applied to John3:16 where Jesus is referred to “his only begotten Son”. The phrase “only begotten” translates the Greek word monogenes. This word is variously translated into English as “only,” “one and only,” and “only begotten.” So what does monogenes mean? According to the Greek-English Lexicon of the New Testament and Other Early Christian Literature (BAGD, 3rd Edition), monogenes has two primary definitions. The first definition is “pertaining to being the only one of its kind within a specific relationship.” This is its meaning in Hebrews 11:17 when the writer refers to Isaac as Abraham’s “only begotten son” (KJV). Abraham had more than one son, but Isaac was the only son he had by Sarah and the only son of the covenant. Therefore, it is the uniqueness of Isaac among the other sons that allows for the use of monogenes in that context. The second definition is “pertaining to being the only one of its kind or class, unique in kind.” This is the meaning that is implied in John 3:16 (see also John 1:14, 18; 3:18; 1 John 4:9). John was primarily concerned with demonstrating that Jesus is the Son of God (John 20:31), and he uses monogenes to highlight Jesus as uniquely God’s Son—sharing the same divine nature as God—as opposed to believers who are God’s sons and daughters by adoption (Ephesians 1:5). Jesus is God’s “one and only” Son. So here in order for the scripture to tie up with other scriptures about Jesus, clearly the 2nd definition offered is the most logical and accurate. This leads us nicely into understanding why we believe Jesus is God and not a created being. So even using the JW Bible it clearly shows that that he is equal to God and that every name should bend (worship). It also talks about Jesus “emptying” himself, this is very important as it shows he relieved himself of his Godship when he became a man on Earth and that is why he could say that his Father was greater than him at this time. But when we read Isiah 44:6 Jehovah is God and there is no one before me or after me. So if Jesus is even called “A God”, as there is only 1 (true) God, then he must be Jehovah. Jesus’ Equality with God 18 For this reason therefore the Jews were seeking all the more to kill Him, because He not only was breaking the Sabbath, but also was calling God His own Father, making Himself equal with God. Revelation 1 17,18 When I saw him, I fell as dead at his feet.And he laid his right hand on me and said: “Do not be afraid. I am the First and the Last, and the living one, and I became dead, but look! I am living forever and ever, and I have the keys of death and of the Grave. 1 Both Jehovah & Jesus is called the “alpha & Omega, the First & the Last. Clearly you can’t have two “first & lasts” so Jesus must also be Jehovah. 2 It confirms in Rev 1:17,18 that God became dead, but as we know Jehovah(Father) never died, so it must be referring to Jesus. Now to add further weight to the identity of Christ, is where both Jehovah & Christ is called the “I AM”, this surely would give any witness no doubts that Jesus is God, if the scriptures actually said this. The problem here the NWT has translated “I AM “to “I have been”, but is there any genuine bases for this? The JW Organization made the change on the basis of using a “Perfect Indefinite Tense”, but as Dr Mantey outlined, there was NEVER a “perfect indefinite tense” in the Greek language. Instead it is clearly shown as a “present indicative tense” and thereby “I AM” is the correct translation. Most importantly the original Greek is the same here in John when referring to Jesus as it is with Jehovah in the Old Testament, so absolute proof that Jesus is the “I AM” and therefore God. Clearly deliberate plagiarism on behalf of the Watchtower Body. As we know the Jehovah’s witnesses claim that the Holy Spirit is God’s active force, or put it another way “just a force with no personality” but is this true from the Bible? Then Peter said, “Ananias, how is it that Satan has so filled your heart that you have lied to the Holy Spirit and have kept for yourself some of the money you received for the land? 4 Didn’t it belong to you before it was sold? And after it was sold, wasn’t the money at your disposal? What made you think of doing such a thing? You have not lied just to human beings but to God.” How would that be possible if the Spirit was just a force, how can you lie to wind, or electricity? So we see that by lying to the Spirit, you are in fact lying to God. But does that conclusively mean he rose as a spirit? So we can see a physical body also has a spiritual body, and therefore on its own does not negate the possibility that Jesus was risen as a Physical body. Paul not only states that one of the main tenants of the gospel is the belief that Jesus rose from the dead, but in verse 17, he goes on to say that “if Christ has not been raised, your faith is worthless; you are still in your sins. Jehovah’s witnesses believe that as much as Jesus died for us and that it is a free gift, they still push the point that in order to gain salvation you must “Be part of God’s Kingdom established on earth, being the Watchtower Bible & Tract Society” and even recently at their 2013 District Convention reiterated that “you can only have a hope of everlasting hope (salvation) is by partaking from Jehovah’s table as provide by the WTBS and that the only other table offered is that coming from Satan”. They go on by explaining that you need to “take in knowledge”, be “obedient to God, by being obedient to the WTBS”, “attend all meeting of the WTBS”, only “read their literature”, “preach the good news of Jehovah’s Kingdom”, representing God’s gospel, otherwise you will not gain everlasting life. Does this not sounds like a works based salvation? Is this true and more importantly what does the Bible say? Despite some efforts by the Watchtower, the verse still reads that “YOU are SAVED by FAITH”, it is a FREE GIFT, and it is NOT BY WORKS, and ANY WORKS are what God determines in advance. So how can any works that we do have anything to do with our “earning” salvation, clearly none at all, as they are God’s that he wills in us. Of course the JW’s say that “Faith without works is Dead” (James 2:17) which is true and biblical, but here we need to be careful with the context and that it must not contradict Ephesians. Simply explained: Works are not to get saved but “BECAUSE YOU HAVE BEEN SAVED”, again this re-emphasizes that it is God’s grace that we are saved, we can never earn it. So how does this then fit in terms of how you walk out your salvation? This is where the Gospel comes in, Jehovah witnesses when asked say “it is preaching the good news of the kingdom and the hope of everlasting life on Paradise Earth”. But is that what the Bible means by “Preaching the Good news”? When we read through the New Testament we can clearly see the “Good news” is also referred to the “Gospel”, and the Jehovah’s Witnesses have no problem with this, which is a good start. So what is the Gospel,? Well the Bible does refer to the Gospel in many ways, in terms of Kingdom, faith, good news etc, but these terms are not completely unpacking what the Gospel specifically means and also what is the most key element. So what do we mean by “preaching the Kingdom/Good news”? Fortunately Jesus helps us here, where he himself is asked this very question. 1 Corinthians 15 1-4 NWT: “Now I remind you, brothers, of the good news that I declared to you, which you also accepted, and for which you have taken your stand. 2 Through it you are also being saved if you hold firmly to the good news I declared to you, unless you became believers for nothing. 3 For among the first things I handed on to you was what I also received, that Christ died for our sins according to the Scriptures 4 and that he was buried, yes, that he was raised up on the third day according to the Scriptures. To receive Christ this is clearly spelt by in Romans 10: 9,10 NWTFor if you publicly declare with your mouth that Jesus is Lord, and exercise faith in your heart that God raised him up from the dead, you will be saved. 10 For with the heart one exercises faith for righteousness, but with the mouth one makes public declaration for salvation. This is probably the saddest part of the Jehovah’s Witnesses efforts is they miss the whole point that it is not about their fruits (works), or in preaching the hope of the Kingdom and eternal hope on paradise earth, if as they do, omit the pre-requisite of entering the Kingdom and be guaranteed salvation, they must first accept Christ, and then walk in the Spirit, which will lead them to all that they preach.